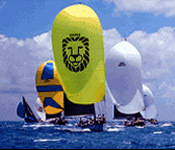 The Caribbean offers the excitement of spectacular sailing regattas. Sail with Forever Young or Slo Dancin along the race course, see the spinnakers pop on the downwind leg and cheer on the international crews. You can then join them for exuberant parties ashore after the races! Sail with us from St. Thomas or be picked up at the race island in time for all the fun.